25 Quick & Dirty Map Tutorials Guide Kickstarter is running 30 days, Aug 2nd until Sept 1st to fund a series of RPG map tutorials guides using any standard graphics software (Photoshop, GIMP, Illustrator, Inkscape, Xara Photo & Graphic Designer). By Michael Tumey, a professional RPG cartographer having done commissions for Iron Crown Enterprises, Dog House Rulez, Rite Publishing (all the maps for the Kaidan setting of Japanese horror), ProFantasy Software (189 map objects for the Modern Map Symbol Set), Paizo Publishing (original hand-drawn map of city of Kasai for Jade Regent Adventure Path) - since 2007. Kickstarter attempting to fund 4 guides: 25 Quick & Dirty Map Tutorials Guide, 25 Advanced Quick & Dirty Map Tutorials Guide (1st stretch goal), Hand-Drawn Map Tutorials Guide (2nd stretch goal), 3D Elements in Mapping Tutorials Guide (3rd stretch goal). 2 map object sets at $25 and $50 backer levels. Have already reached goal and now only $1500 from 1st stretch goal. Check it out! Spread the word! 25 Advanced Quick & Dirty Map Tutorials Guide (1st Stretch Goal) is UNLOCKED! So now you're getting everything you need to understand how to create photo-realistic maps. Now we're onto our next Stretch Goal at only $3000 away (and my favorite subject): Hand-Drawn Map Tutorials Guide! Thank you all pledgers for getting us so far so fast! Instead of creating some random starship deck plans, I'm working on creating multiple versions of starship bridges, galley/rec centers, crew quarters, engineering sections, cargo holds, medical bays, then single versions of brigs, storage lockers, armory, cold sleep chambers - then providing each complete chamber as a "map object" or "ship section module" so gamemasters can pick which chambers best fit their idea of the perfect ship deckplans. I will include some sample deckplan configurations using the different chamber objects. This seems a lot more useful for sci-fi mapping duties. 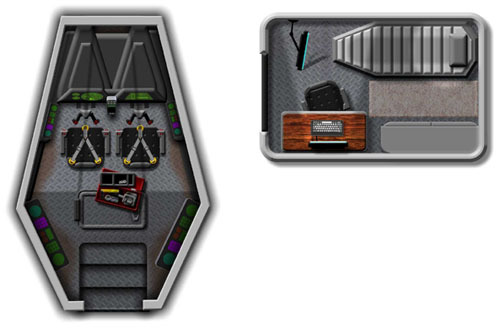 MichaelTumey wrote: Instead of creating some random starship deck plans, I'm working on [...] providing each complete chamber as a "map object" or "ship section module" so gamemasters can pick which chambers best fit their idea of the perfect ship deckplans. 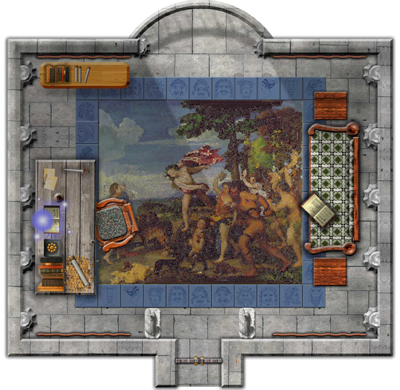 Agreed, tile-based maps are always easier for on-the-fly mapping, even if it's just large room-sized tiles like those. Kickstarter Update #11: Stretch Goal #2 - The Hand-Drawn Map Tutorials Guide Book has been UNLOCKED! We have less than 6 days left in funding and 2 more hoped for stretch goals to fund. Using 3D Elements in Mapping Tutorials Guide Book is the next stretch goal. Note: not only will I be including all my 3D techniques in mapping, but this guide will feature chapters written by Anna Meyer of Greyhawk Maps, and Waldronate, the software developer for Wilbur. So there will be plenty of expertise to get you solid in your 3D mapping. Please join us if you can, and thank you for those who already have!